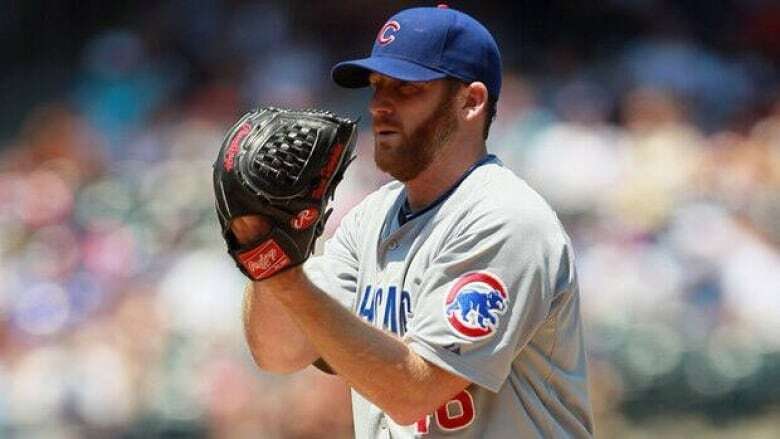 The Texas Rangers have obtained Ryan Dempster from the Chicago Cubs, a move to fortify their rotation for the stretch run. In return, the Cubs receive minor league infielder Christian Villanueva and pitcher Kyle Hendricks. The Texas Rangers won the Ryan Dempster sweepstakes, acquiring the Chicago Cubs ace for two minor leaguers moments before Tuesday's trade deadline. The AL West leaders fortified their rotation for the stretch run, sending infielder Christian Villanueva and pitcher Kyle Hendricks to Chicago. Dempster, who had power to block deals, had refused to approve a trade to Atlanta last week. The Los Angeles Dodgers and New York Yankees also tried to land the 35-year-old righty. Dempster was 5-5 with a 2.25 ERA in 16 games for the Cubs and can become a free agent after the season. He was one of several players Chicago traded in a 24-hour span, with pitcher Paul Maholm and outfielder Reed Johnson going to Atlanta and catcher Geovany Soto to Texas. Teams had until 4 p.m. ET to complete trades without waivers. From now until the end of the season, clubs have a chance to claim players before they are dealt. With a strong season that included a 33-inning scoreless streak, Dempster was one of the most attractive pitchers on the market. The Rangers were looking for pitching help even though they began the day leading with a 59-42 record and a 3 1/2-game lead over Oakland in the AL West. The Dempster trade came less than a week after the division rival Los Angeles Angels got former Cy Young winner Zack Greinke in a swap with Milwaukee. Many fans expected Texas to counter with a big move, and the Rangers pulled it off. The two-time AL champion Rangers needed help with their rotation. Right-hander Colby Lewis underwent surgery Friday to repair a torn flexor tendon in his elbow and will miss the remainder of the season. Roy Oswalt has struggled, too, since signing as a free agent in midseason and is being moved to the bullpen. "He might be a guy like Colby [Lewis]," Rangers outfielder David Murphy said. "I loved seeing a guy like that pounding the strike zone and working late into games. [Dempster] might have an advantage off the bat because not many guys in this league have seen him much at all." The Cubs had agreed to deal Dempster to Atlanta last week, but he did not give his approval. "I just never said no," he said, adding he needed time to think about it. "The last few days, I had to give it a lot more thought to the teams I might possibly be traded to." "We'll see," said Dempster, a third-round draft pick by Texas in 1995. "There's no right or wrong decision. There's just journeys in life that we end up taking. We try to make the most out of those. They've got a great ballclub down there. They've got some really good baseball players." His preference was to play for the Dodgers, and although the teams remained in contact right until the end, general manager Jed Hoyer said they were never really close. Dempster spent the last few hours before the deadline in the Cubs' offices, and when it became clear a deal with the Dodgers was unlikely, he allowed other teams to get in the running. Hoyer insisted there was no lingering animosity over the Braves deal falling apart, although they did have to hash out some things. "There were a lot of conversations," Hoyer said. "It's hard. He felt like he had a place he wanted to go. ... He wasn't unprepared to make a decision, but I think when the decision actually came and there was the finality of it, he wanted to wait a little longer and explore his options." "So there were a lot of conversations. I think he indicated the communication with the front office has been good. ... We wouldn't be doing our job and we wouldn't have been fair to Atlanta if we weren't constantly in communication with Ryan," he said. With a contract set to expire after the season ends, Dempster simply wasn't part of the plan with the Cubs in a rebuilding mode. They hired president of baseball operations Theo Epstein and Hoyer, hoping they could put together the first championship since 1908 after they helped build two title winners in Boston, ending a long drought there. Had the Rangers deal not gone through, Hoyer said Dempster probably would have remained a Cub. He was scheduled to start Tuesday against Pittsburgh, but Casey Coleman took his spot after being recalled from Triple-A Iowa along with infielder Adrian Cardenas and catcher Welington Castillo. Hoyer said teams had also shown interest in outfielder Alfonso Soriano and pitcher Matt Garza, but they remained with the Cubs. The fact that Garza has been sidelined lately by a slight fluid buildup in his right triceps area didn't help his value. The Cubs hope he'll be ready to pitch Tuesday at San Diego. "The timing didn't allow teams to feel like they could see him out on the mound and I understand that," Hoyer said. "Teams are making trades this time of year to try to win the World Series." A Garza deal would have left the Cubs without their top three starters. The Dempster trade is just the latest in a series of moves for a franchise that dealt the troubled Carlos Zambrano to Miami in the off-season and hired manager Dale Sveum to replace Mike Quade. They're trying to stock up on prospects, particularly pitchers, and that meant saying goodbye to a popular team leader who was active in the community. Dempster was coming off Tommy John surgery and had been released by the Reds when he signed with the Cubs before the 2004 season. He spent several years as the closer after replacing LaTroy Hawkins before being moved back to the rotation in 2008. He responded with a career-high 17 wins and a 2.96 ERA for their most recent division winner, and he's been mostly steady ever since, rebounding from a difficult season last year. "He knows how to make adjustments," Soto said. "He's known how to reinvent himself. Whatever he's been doing has been working." The 22-year-old Hendricks was 5-8 with a 2.82 ERA at Class A Myrtle Beach. The right-hander was a Carolina League All-Star, and has struck out 112 and walked just 15 batters in 130 2-3 innings. The 21-year-old Villanueva is hitting .285 with 10 home runs and 59 RBIs with Myrtle Beach.